Norwood Hill consists of a somewhat scattered community, with no real centre apart from the cross-roads, and that well-known landmark The Fox Revived. 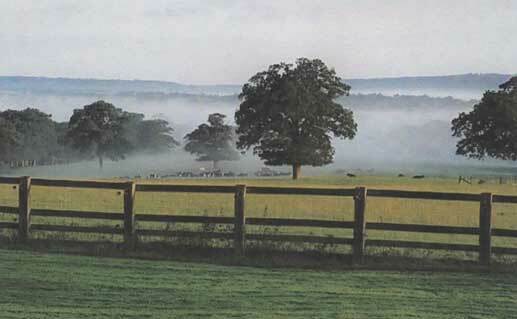 Norwood Hill, approximately 2 miles North of Charlwood, is a limestone ridge 300ft above sea level on the edge of what was the Wealden marsh. The Parish and Borough / District boundaries run through the middle, so half the community is in Charlwood and Mole Valley, and the other half in Sidlow and Reigate & Banstead. It also falls within three parish church boundaries, Charlwood, Sidlow and Leigh. Thirteen Roman coins – all silver, no bronze – dating from BC91 to AD 161, were unearthed recently in a field near the top of the hill. Six religious artefacts from the same period were discovered with the coins, leading archaeologists to suspect that the coins were used for ritual or worship. In medieval times, Norwood Hill was much more heavily wooded. 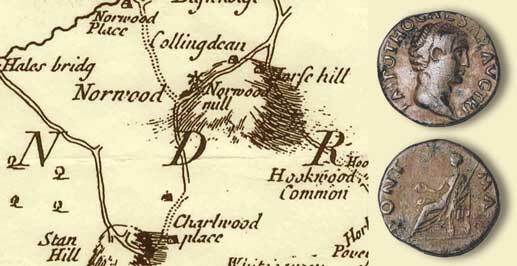 To those in Charlwood it was ‘the North Wood’ which became Norwood. The most extensive remaining piece of woodland is Edolphs Copse. This was recovered from private ownership in the 1980s with the generous help of the Thomas Alexander Mason Trust, local residents and the Woodland Trust. 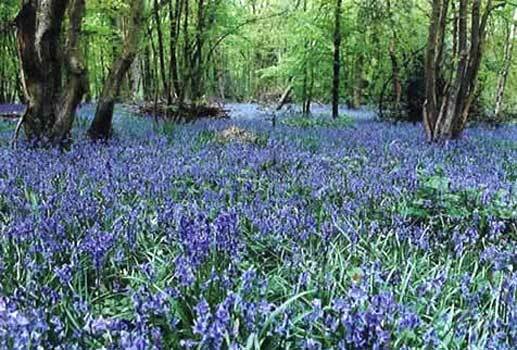 It is home to a number of rare species of plant, for which it has Local Nature Reserve status. Butterflies include the silver-washed fritillary and the white admiral which thrive particularly in the open meadow which is only cut every two years so as to help insects survive. Coppicing and selective felling are done every ten years or so. 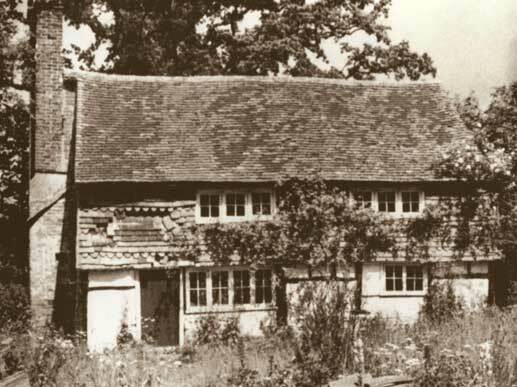 The oldest houses (15th/16thC) in Norwood Hill are Brittleware Farm, Little Chantersluer, Collendean Farm, Highworth, Horsehill Farm, Little Mynthurst, Morgans, Norwood Place, and Roundabout Cottage. There were old cottages on the site of some of the other houses in the community but only the larger houses are shown on the old maps. Iron ore was mined around Charlwood and beyond and smelted widely in the area round the village. Coppicing provided the charcoal but timber was needed for housing and ship-building. Demand was such that Norwood Hill woods were steadily plundered. The formerly wooded areas were known as ‘waste’ and it became the custom to run pigs (or ‘hogges’ and ‘all manner of swine’) in these areas. There are still some orchards along the hill but all the pigs have now disappeared. Norwood Common covered much of the land around the crossroads, running from Roundabout Cottage in the NW to Brittleware Farm in the SE. The common provided grazing for those with small or no properties. They also provided overnight grazing for cattle being driven from Sussex, particularly from the Horsham Fair, to the meat markets in London. The commons were enclosed in the 1840s and in time the footpath to the west of the cross-roads became a more substantial road, thus leading to the cross-roads as it is now. Horsehill used to be one of the main roads from London to Brighton. But Horsehill in winter was steep and muddy. Around 1815 the main road was re-routed (becoming the present A217) to make it easier for George IV to get to his Pavilion in Brighton. The coaching inn at the top of the hill, The Black Horse, then moved to Hookwood. Hog Field, Lower Carthorse Meadow, Deer Field, Clover Field, Hayband Field, Cabbage Field, Daisy Field, Angry Field, Windmill Field, Raw Bones, Bare Bones, Little Kiln Field, Orchard Field, Honey Field, No Man’s Field, Crab Tree Platte, Pigletts, Slaughter Wicks, Saw Pit Field, Butter Field, Sedge Pit Field, Heronshead, Irons Mead, Sandy Field, Heaven Field, Hedge Hog Field, River Field, Yew Tree, Malt Looks, Fish Pond Field, Hop Platt, Chick Field, Clay Pits. Although there has never been a church in Norwood Hill, there was a nonconformist preacher’s cross in the Saxon round field at the foot of the hill near Brittleware, probably dating from the 18th century. In the 20th century a chapel was established on Collendean Lane for the United Reform Church but it eventually fell into disuse. 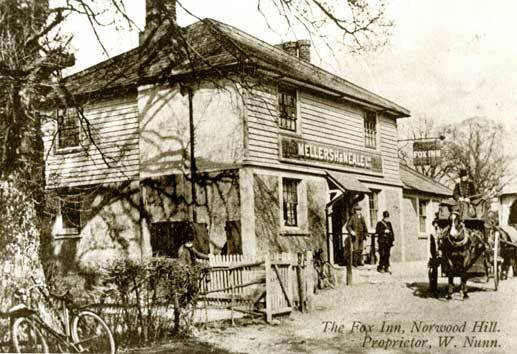 The Norwood Hill Shop on Collendean Lane also contained a post office. When this closed in the late 1970s, the house name was changed to Post End. Dances, plays and WI meetings took place in a community hall on Smalls Hill Road but this was demolished in the 1960s. Point-to-point meetings were held up to the 1960s below Rowgardens on the south side of the hill. 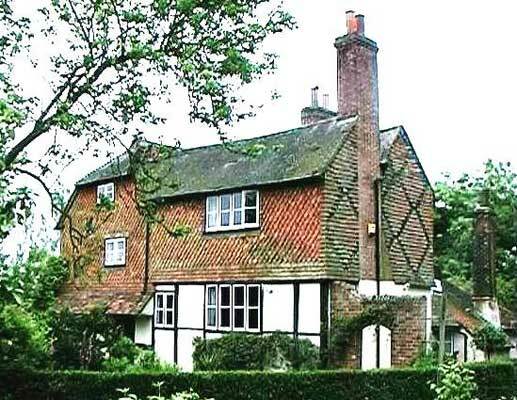 In those days the Rowgardens estate comprised more than 800 acres covering five farms including Charlwood Place Farm. Two things that continue, though – cricket and the pub!